The question, frequently asked of horsemen and Del Mar Thoroughbred Club personnel at this time of year, was put to trainer Peter Miller. Are you glad or sad to see the summer season coming to an end? Miller will send out representatives in two races on Monday’s final card of the 79th summer season. He’ll draw the curtain on what he’s described as a “dream” season and the best meeting of his 30 years as a trainer. He enters the final day with 31 wins 16 seconds and 13 third-place finishes from 113 starters, a 27 percent win rate and 53 percent in-the-money figure. Miller, 51 and an Encinitas resident, long ago secured his third summer season training title – Doug O’Neill trails by 10 entering the final day. Miller will be seeking a third straight title at the Bing Crosby Fall meeting when racing returns to Del Mar on Friday, November 9. Miller’s 31 wins is one shy of the most in the 2000s (Bob Baffert, 2000) and tied for second with the victory totals of O’Neill in 2010 and John Sadler in 2008-09. “It’s a team effort,” Miller said. “It’s my name on the program, but there are 40 people behind me that do the work. I have a great team of grooms, hot walkers, exercise riders at the stables. And I have great owners who let me put their horses in spots where I think they have the best chance to win. Del Mar Derby winner Ride a Comet and Juvenile Turf winner King of Speed were both fit and happy following Sunday’s efforts, their handlers reported. Trainer Mark Casse shipped Ride a Comet in from the east seeking the firm turf wasn’t always to be found at Saratoga or Woodbine, and was rewarded when the Candy Ride colt rallied under Drayden Van Dyke for a 1 ½-length victory in the Grade II $250,000 event. Ride a Comet will be headed for Churchill Downs late Tuesday night, but Melton didn’t rule out the possibility of a return for the fall meet, a decision that Casse and the owners John C. Oxley and My Meadowview Farm will make. Trainer Jeff Bonde said that King of Speed was in good shape Sunday morning. “We’re excited, that was a very nice win,” Bonde said. The victory provides encouragement to consider the $1 million Breeders’ Cup Juvenile Turf in November for the Kentucky-bred son of Jimmy Creed and that’s the plan, Bonde said. The next step in that direction will be the Zuma Beach Stakes at Santa Anita on October 8. Bonde has a chance to enhance an already successful closing weekend when he saddles 7-5 morning line favorite Miss Sunset in the $75,000 CERF Stakes for California bred fillies and mares, the fifth of 10 races on the closing day program. Miss Sunset, a 4-year-old daughter of Into Mischief, is the defending race champion and has nine wins from 17 starts and more than $800,000 in career earnings. The victory on King of Speed was No. 100 for jockey Gary Stevens at Del Mar. Stevens, 55, was a 22-year-old not long out of Idaho when he rode Tsunami Slew to victory in the 1985 Eddie Read Handicap. “Tsunami Slew would get really nervous and wash out, but I got along really good with the horse in the mornngs,” Stevens recalled. “I warmed him up before the race and he started to get a little bit nervous so I walked him over to the outside fence, where there was a hedge in those days. He stuck his head in there and started eating the leaves. “I just left him alone, but I was thinking Eddie Gregson is probably wondering what the hell I’m doing right now and I hope these things aren’t poisonous. Drayden Van Dyke had three wins on Sunday to two for Flavien Prat. Van Dyke goes into the closing day program with a 40-37 lead over the defending champion in search of what would be the first major Southern California title for Van Dyke. Van Dyke has six scheduled mounts and Prat eight, so mathematically, the race for the title is still on. But Prat is more a realist than optimist knowing what he’s up against in momentum-driven Van Dyke. Van Dyke—Summering (4th, 6-5), Lake Time (5th, 8-1), Flagstaff (7th, 3-1), Rayana (8th, 7-2), Rowayton (9th, 3-1) and Nevermissesabeat (10th, 5-1). Prat – Bank Walker (3rd, 7-2), Angel Alessandra (4th, 5-1), Classy Tune (5th, 3-1), Comes the Dream (6th, 4-1), King Cause (7th, 10-1), My Sweet Baboo (8th, 6-1), Spin Lightning (9th, 6-1), and The Hunted (10th, 6-1). Also of interest is the race for the title of top apprentice rider. Assael Espinoza enters the day with 20 wins and six riding assignments, Heriberto Figueroa has 19 wins and four mounts. Racing Secretary David Jerkens had thanks Monday morning to the horsemen and his office staff for a meeting that was successful by any measure. While the number won’t be finalized until after the last race is run, Jerkens projected average field size to be 8.7 or 8.8, up a tick from the 8.6 of the 2017 summer season. “I believe we’ll be up around 50 starters from a year ago,” Jerkens said. “I’m pleased with that and with the racing product we’ve been able to put out there every day. “It’s been a good meet in terms of safety. Credit to Dennis Moore (Director of Track Maintenance) and Leif Dickinson (Turf Course/Grounds Superintendant) the track surfaces have performed well, both turf and dirt. 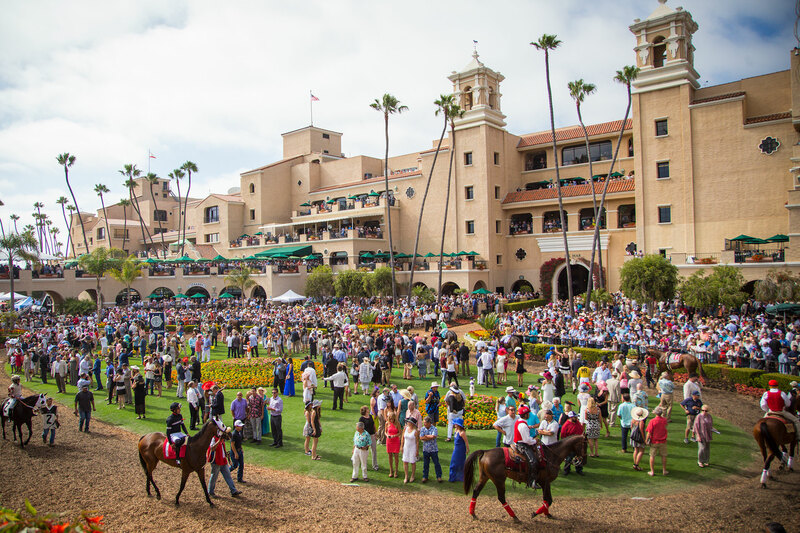 “The owners and horsemen have supported Del Mar every day through the entry box and enabled us to put out the best program we can every day for the players and fans. CLOSERS – Selected works from 102 officially timed Monday morning: Skye Diamonds (3f, :37.00), Dabster (5f, 1:00.40), Roman Rosso (5f, 1:00.80 … David J. Beltran’s latest work, with co-author William A. Miller is “Rex C. Ellsworth, Racing’s Cowboy King,” an unauthorized biography of the horseman whose homebreds like Swaps, Terrang, Prove It, Candy Spots and Olden Times achieved some great things in the mid-20th century. Ellsworth was the leading owner at Del Mar in 1954. The self-published work is available for on-line purchase…In addition to being jockey Mario Gutierrez’s agent, Tom Knust is branching out into producing films. His current project, set in Vietnam during the war, is entitled “Ducks In A Tree” … Thanks to all Stable Notes readers. With luck, we’ll be back for the Bing Crosby Fall Meeting, which begins on Friday, November 9.